This Saturday, I had the pleasure of welcoming Louisiana Governor Bobby Jindal to the Grand Opening of the Coral Springs Romney Headquarters. The Grand Opening was mentioned in www.browardbeat.com, with excerpts below. I’ve gotten two e-mails from the Broward County Republican Party in the last week. That’s two more than I got from the Broward County Democratic Party! There is no doubt that Republican Chair Richard DeNapoli has modernized the way the GOP gets its message out. DeNapoli wanted to inform me that Gov. Bobby Jindal of Louisiana will open the Coral Springs Romney Headquarters on Saturday. The even starts at 4:30 p.m. at 10200 West Sample Road. I can’t believe Louisiana or a politician from that God Foresaken state has anything to teach us. 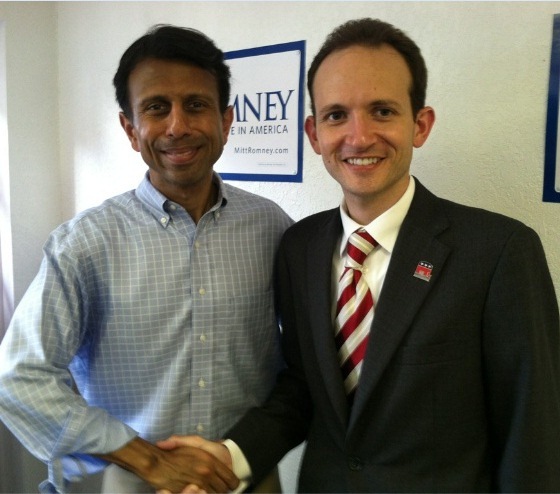 Maybe Jindal changed things…but somehow, I doubt it. When I was young and using the ID press pass you see on this page, I was sent to Louisiana to cover the arrest of a teenager who had killed a number of people in Fort Lauderdale. I couldn’t wait to get out of that backwater, poverty-stricken place. That aside, there is a point to be made here. DeNapoli also uses e-mail and Facebook to troll regularly for volunteers to phone bank, walk door-to-door and work in offices. The point I’m making is whoever runs the Broward Democratic Party needs to step up the Internet effort. On every platform available. in Coral Springs This Saturday, July 28th! Click below to Register at One of Three Romney Victory Offices in Broward County! Join Mitt Romney’s Campaign Today! The election this November will once again come down to Florida and Mitt Romney needs our help to ensure victory on election day. The White House cannot be won within a Republican victory in the State of Florida and it’s going to take the efforts of every Floridian committed to the defeat of Barack Obama. We are phone banking and walking precincts right now, and we need your help! There are now three office locations in Broward County! Register now by clicking the link above to let us know when you can help! In an effort to show strong support for Mitt Romney in Florida, we are also assembling coalitions of people who have similar interests. From Seniors to Veterans, to Young Professionals and Doctors, these coalitions are free to join and do not require any time or effort. By simply adding your name to a coalition, you can help show other undecided voters that Mitt Romney has strong support from Florida voters with similar affiliations. This simple task can make a difference in Florida, so please take a moment to click on the link above to join one or more coalitions in support of Mitt Romney. If you know of anyone that may fall under any of the coalitions, or anyone else you think might want to volunteer, please take the time to forward this e-mail to them with a request from you that they join you in support of Mitt Romney. If you have any questions or suggestions, please do not hesitate to contact us at 954-941-7775 or email headquarters@browardgop.org. I appreciate your efforts & support for victory in November. Dr. Snipes informed the media (on May 21, 2012) that about 5,000 dead people had already been removed from the voter rolls, yet the hundreds that the BREC found still remained on the rolls. After the BREC received coverage in the local newspapers, CBS News 4 (Miami), and Fox News, the names of the dead yet still “active” voters that the BREC discovered were finally removed the weekend before our June BREC meeting. Chairman DeNapoli announced the Broward GOP’s success at the June 25, 2012, BREC meeting. You can watch the video by clicking below.